Fight over the dreamscape until morning in Dare to Dream, an upcoming card game that's currently on Kickstarter. 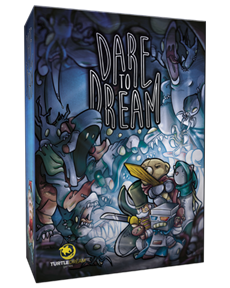 Dare to Dream is an asymmetrical battle between The Darkness - a single player with endless hordes of monsters and nightmares at their disposal - and The Dreamers - a team of players who must rely on their few loyal Guardians to protect them through the night. Every hour, new Monsters and Nightmares can brought into play by The Darkness and sent at the Dreamers. Monsters and Nightmares are fleeting things, gone forever once they have been used, while the Dreamers' Guardians persist through the night. The Dreamers' goal is to win by outlasting The Darkness; if morning safely arrives, the Dreamers win. But if The Darkness can wake the Dreamers enough times, the forces of dread have prevailed and The Darkness wins instantly! The game is on Kickstarter just for a couple more days, so don't miss it out!